The declarations accompanied a report prepared by the gun manufacturer's parent company, American Outdoor Brands, on potential "reputational risk" associated with gun violence in the United States and efforts it was making to develop guns with electronic locks or GPS monitors. The company produced the report after a group of investors, who bought shares in the company with the express purpose of trying to change its internal policies, were able to win a vote forcing them to do so. "Today's report complies with a Resolution that was passed by a small percentage of our shareholders in September," American Outdoor Brands told the Washington Free Beacon in a statement. "Despite the fact that the Resolution was put forward by parties whose interests were not aligned with those of our customers, or those of our shareholders seeking true risk mitigation and value creation, the report represents our good faith effort and investment of company resources. Its contents demonstrate that our reputation with our customers for protecting their Second Amendment rights, and our ability to manufacture the high-quality firearms they want to purchase, are paramount to sustaining and growing our market share and stockholder value." The statement is sure to disappoint the activist investors who initiated the report. That group is led by the Adrian Dominican Sisters, a small group of about 600 women who decry "easy access to guns" as responsible for gun crimes. The group has engaged in similar activism at a number of other publicly traded companies to pursue a wide range of political goals. The group said its goal is to achieve social justice and change the way gun companies operate. "When I say that I’ve always been interested in social justice, it isn’t just to know about it and be aware of it, but to bring about change and bring about justice," Sister Judy Byron, a spokesperson for the sisters, told NBC News of the group's efforts. "We're looking to change the system." 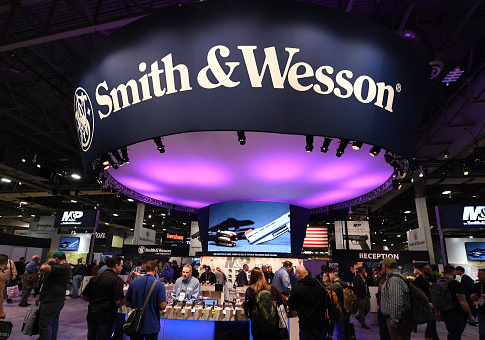 Rather than being responsible to their shareholders, Byron said the group is hoping to hold Smith & Wesson responsible for crimes committed with firearms. "I think it can't just be about their fiduciary responsibility, but what is their responsibility to society? The costs of gun violence, the loss of life, all the expense to our health care system," she told BuzzFeed in 2018. In contrast to the claims of the activists, the report found more risks in siding with gun-control activists than in continuing to sell firearms which remain in high demand. "AOBC's customer base of knowledgeable, law-abiding firearms purchasers views criminal acts solely as the responsibility of the criminal actor, and does not blame manufacturers of firearms, including Smith & Wesson, for criminal behavior," the company told the Free Beacon. "Actions which seek the approval of non-customers or anti-gun groups would not only be futile, they would damage AOBC's business and reputation." The company's reasons for refusing to bend to gun-control activists is informed by its own history. Smith & Wesson nearly went bankrupt after facing backlash from customers for a wide-ranging deal with the Clinton administration in 2000. That deal featured a promise to manufacture smart guns and institute conditions beyond what was required under federal law on anyone who sold their firearms. The company eventually admitted the deal ended up hurting their business and even led to plant closings and layoffs. The report also included research on media coverage of gun violence conducted by an outside firm that found the company's reputation was not at risk from crimes committed by third parties. "A 12-month retrospective media analysis by a leading independent social media monitoring and competitive intelligence firm demonstrated that gun-related violence does not correlate with a negative reputational risk for AOBC," the company said of their report. "The monitoring also showed that gun violence events are not brand focused, rather they involve general crime and gun industry issues." The report said the company would continue to monitor media reports over the next year in hopes of verifying their initial findings. It also said the company would continue to monitor smart-gun technology for viability in the coming years in case a market does develop. In addition to the report, American Outdoor Brands also released a list of core company principles it advised stakeholders to keep in mind when interacting with it. The principles include a responsibility to "defend the Second Amendment," recognizing the landmark Heller Supreme Court decision as "settled law," and better enforcement of existing gun laws. "The Second Amendment of the United States Constitution guarantees the right of private citizens to keep and bear arms," the first principle reads. "AOBC recognizes that its customers view the Company as a steward of this right and will act accordingly." Ultimately, the company said it would not change its current operations in any significant way despite the actions of certain investors. "We maintain our long-standing commitment to developing and manufacturing high-quality firearms that operate in a safe and reliable fashion, while encouraging their safe and lawful use."